I made this cake last night to continue celebrating Matt's birthday and to share with our moms. 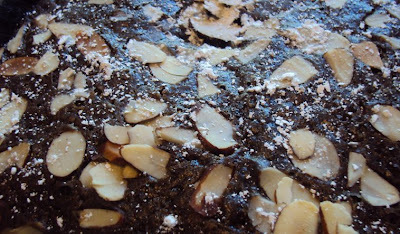 It is a chocolate cake with a light almond flavor, topped and baked with organic almond slivers and once cooled dusted with powdered sugar. Really nice, not to heavy! Today I got to witness two of the baby bird's fly off! One must have flown off recently since only one little one is left - I gave it some words of encouragement today. They grew up so fast. It was so nice having them around and it let me appreciate birds like never before. I wished them all good luck and to come visit anytime they want! There will always be bird seed out! Yum, sometimes a lighter, unfrosted cake is just perfect!